Many years ago, a young man with talent and a dream of establishing himself in the motorcycle business decided to leave violence torn, 1950's Buenos Aires, Argentina during the infamous reign of President Juan Peron. This was the founder of Kon-Tiki Motorcycles, George Arrues. 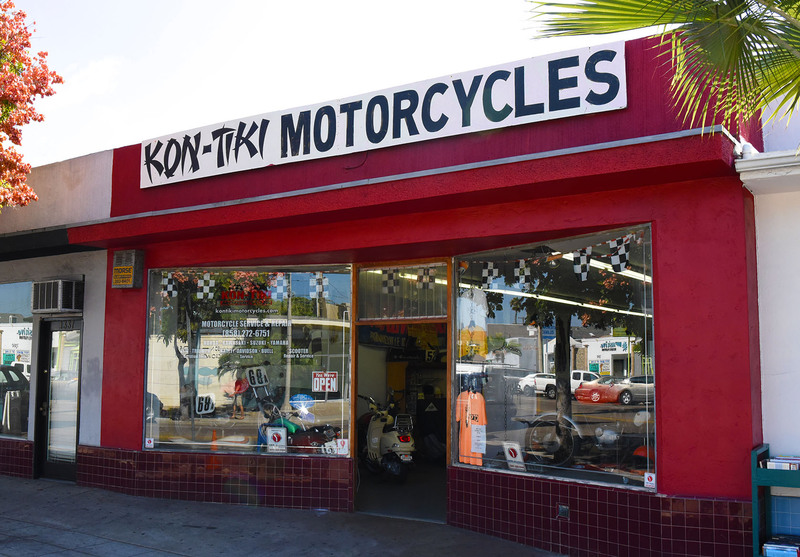 Here at Kon-Tiki, we work on all types of bikes from Harley's to Scooters. Each bike is treated with the utmost care and precision to get you exactly what you need to be back on the road. Having served customers in Pacific Beach for over 50 years, we welcome any project you can throw at us. Shop for Kon-Tiki shirts and merchandise on Ebay and Amazon. With creative and designs and logos dating back to the origin on Kon-Tiki in the 60's, there's something for any motorcycle enthusiast. Original photos from start of Kon-Tiki motorcycle racing, with rare shots from history. We also have our current builds, projects, and bikes on display. Unique mix of older and newer bikes.